compatible with the PN-EN ISO 9001:2009 norm. 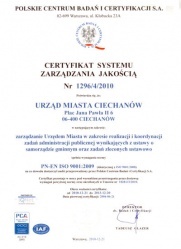 In the aftermath of a complex control in a form of an audit by an independent certificatory institution: the Polish Centre for Testing and Certification, compatibility with all the requirements of the norm has been confirmed. The Office has been awarded an adequate certificate. The Quality Management System introduced in the Office proves that the institution is managed according to the principle of constant perfecting, which is the foundation of quality management. Thanks to the system, the Office is a client-friendly organization, which functions transparently and is predictable in the matter of the quality of work and services. It is believed that the construction of information cards (factsheets) for every repeating service in the Office was an important achievement. The cards are available for clients in every department of the Office, together with adequate forms. Every card includes information about the legal basis, place, and duration of the proceedings, required information and documents, and charges. The cards allowed the Office to construct the Internet Client Guide. The clients do not have to visit the Office several times. The implementation of the management system caused the introduction of many organizational changes and procedures, which allowed the proceedings of the Office to go smoothly. It also allowed the Office to form horizontal structures for especially complicated tasks which require specialists from various fields. In order to allow the system supervision, a team of internal auditors has been appointed and trained. Their task is to conduct internal audits and constantly check the usefulness and adequacy of the system for internal and external conditions. 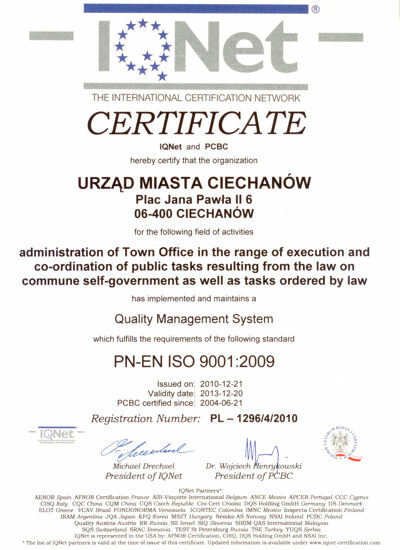 Preventive and corrective actions are undertaken in order to constantly improve the system and allow efficiency of the Office’s activities and client satisfaction.The Quality Policy. The map of processes in the Ciechanów Town Office - divided into the following groups: strategic processes, service-related processes, processes aiding the activity of the Office. 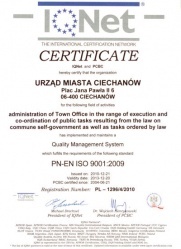 The Quality Management System as a tool of the Office management.